CoQ10 is a far more active antioxidant than previous studies had shown: it protects both the mitochondria and cell membranes from oxidative damage. It also protects the antioxidant activity of vitamin C.
Adequate supplementation with CoQ10 can prevent atherosclerosis. New clinical studies show specific improvements in the cardiac function of patients with cardiovascular disease following supplementation with CoQ10. CoQ10 protects against a reduction in the brain's dopamine activity and helps maintain neurological function. A significant regression of breast and prostate tumours was observed in studies using high doses of CoQ10. New studies confirm previous research which shows CoQ10's ability to protect LDL cholesterol from oxidation, improve production of cell energy and prevent periodontal disease. Studies show that Coenzyme Q10 is almost three times better absorbed when it is delivered in an oil base. As it's a relatively expensive supplement, the question of bioavailability is critical. New encapsulizing technology from softgels means we can offer CoQ10 in a fat-solubilised form at a lower price than the traditional form ! 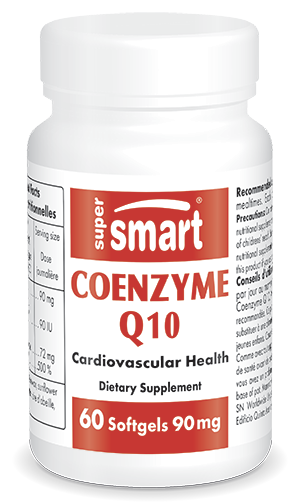 Along with Coenzyme Q10, you’ll find other potent antioxidants on offer from the SuperSmart supplement catalogue. For optimal efficacy, the formulation AntiOxidant Synergy, for example, combines no fewer than 12 natural extracts with antioxidant properties, while Asc2P offers the benefits of the renowned antioxidant vitamin C. Last but not least, there’s butylhydroxytoluene (BHT), a powerful antioxidant with anti-viral effects. Other ingredients: medium-chain triglycerides, D-limonene oil. Each softgel contains 30 mg Coenzyme Q10. Take two or three softgels a day, or more, at mealtimes.